U.S. Coast Guard Sector Sault Ste Marie on Wednesday commenced Operation Taconite, an icebreaking mission launched in response to expanded ice growth in the commercial ports of western Lake Superior, Green Bay and the lower St. Marys River. Before ice impeded commercial navigation, several icebreakers were assigned to each region. Recently, Coast Guard Cutter Mackinaw was dispatched to assist two vessels into the Port of Green Bay. Coast Guard Cutter Alder was assigned to manage the ice breaking needs of western Lake Superior, specifically the twin ports of Duluth, Minn., and Superior, Wisc. 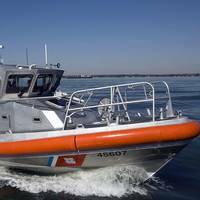 The Great Lakes Towing Company came to the aid of the United States Coast Guard Monday night in the St. Marys River just two miles east of the U.S. Coast Guard Station, Sector Sault Ste Marie, Michigan. 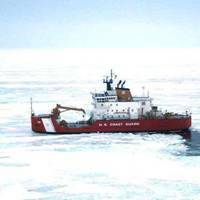 The 140-foot Bay-class Icebreaking Tug Katmai Bay (WTGB 101) was dead in the icy waters and required towing assistance to its homeport dock. Around 10:45pm Monday night, The Towing Company Tug Missouri was dispatched to break ice and assist the USCGC Katmai Bay back to its dock two hours later. The Tug Missouri is also homeported in Sault Ste Marie, Michigan to assist vessels through the U.S. Army Corp of Engineers locks and to provide emergency rescue assistance and icebreaking when needed. The locks connect Lake Superior to Lake Huron. The Coast Guard has conducted an emergency medical evacuation of a sick crewmember from the 1,000-foot laker 'Edwin H. Gott' operating approximately 40 miles northwest of Bayfield, Wis. in Lake Superior. 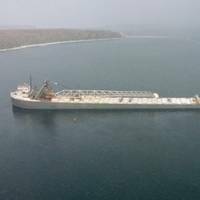 The laker reported that a crewmember aboard was experiencing symptoms of a stroke and the captain later reported that the 60-year-old man's medical condition had been deteriorating rapidly throughout the early morning. SAR coordinators at Coast Guard Sector Sault Ste Marie, Mich., immediately directed the launch of a boatcrew from Station Bayfield, Wis., aboard a 45-foot Response Boat-Medium.